A design for a new bike park at the City of Durango’s Cundiff Park by the Animas River is turning some heads among the local mountain bike community for it’s appeal with riders who want a bike park with a social atmosphere and quick turnaround times back to the beginning of each trail. Outlined in red is the perimeter of the City’s Cundiff Park by the Animas River. Conceptualized by Alpine Bike Parks is a series of jump lines with slopestyle features that would be built near/inside the yellow circle, and a skills area in the orange circle. A proposed progressive trail would follow the westerly, upper perimeter of the park. Satellite imagery by Google Earth. Illustration by Adam Howell. Alpine Bike Parks, a full-service design/build contractor out of British Columbia, had an employee of theirs in town last week who led a presentation/discussion about the feasibility of putting in a bike park at Cundiff Park or Chapman Hill with a group of city officials and about 30 residents. 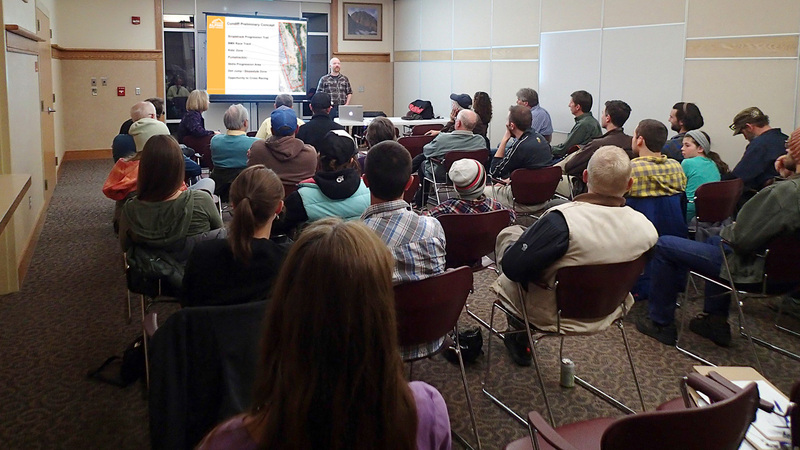 Alpine Bike Parks presented preliminary findings from its analysis of the feasibility study for putting in a bike park at Chapman Hill or Cundiff Park to a group of residents and public officials at the Durango Community Recreation Center. Photo by Kevin Hall. Alpine Bike Parks was hired following City approval last fall to assess the feasibility of building a bike park at Chapman Hill. Daniel Scott, the Project Manager and Designer for Alpine Bike Parks came to Durango last week for three days to check out Chapman Hill, but was enticed to Cundiff Park by City officials because of the fact that the bmx track there was recently acquired by the City. “As we were transitioning last year, they suggested that we might look at some opportunities at Cundiff,” said Metz. Scott presented some preliminary findings to the public at a meeting last Wednesday after seeing the properties in person with City officials. 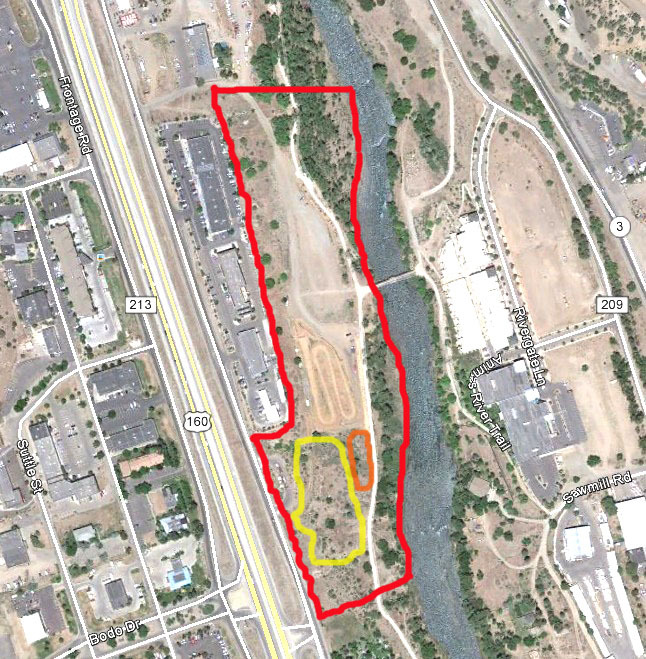 Possible trail lines for either bike park site had not been flagged yet, said Scott. At the public meeting, Scott used a SWOT analysis to encourage people to discuss the strengths, weaknesses, opportunities and threats towards the creation and sustainability of a potential bike park at either Chapman Hill and/or Cundiff Park. Strengths–Possible location for Durango’s first uplift-served (Magic Carpet lift) mountain bike park for gravity-fed downhill trails. Bathroom facilities are already onsite. It’s a more centrally-located park for those living in town. Weaknesses–Project site situated on a north-facing slope at an angle that makes it prone to getting damaged from monsoonal rains. The hill’s hydrology would be effected. Soil would need to be outsourced from a different area due to the rocky nature of the existing soil. Retaining walls, swails, ditches, culverts and a 20-foot wide swath would need to be cut for each flow trail into the hillside, resulting in a visual impact for people that might be sensitive. Opportunities–Opportunity to use a Magic Carpet upflift for getting people to the top of the hill faster after each run. Opportunities for great rock work for features. Threats–A competing desire to put in a second rink where the gun club currently exists could compromise the availability of that piece of land to be used for bike park purposes. Political opposition from mountain bike haters or those sensitive to the visual impacts of a 20-foot swath that gets cut for the flow trail corridors. Strengths–Trails could be ridden over and over again will little interruption for rider who are commuting back to the beginning of each trail. Trail construction would be easier, given the mellower grade and easier access for machinery and people. Trails would be less prone to hydrological erosion. Less land would need to be cleared to build trails there. The riding season would be longer due to greater solar exposure. The park is right next to a hospital. It’s easier to get dirt to Cundiff Park than it would be at Chapman Hill. Weaknesses–A bike park at Cundiff would not serve the gravity-oriented downhill mountain bike riders who currently have a shortage of trails for their riding style. It’s not as centrally located as Chapman Hill. No bathroom or facilities currently exist there. The park is situated in a flood plain. Opportunities–It’s mellow grade makes for some ideal dirt jump slopestyle lines at a grade of 4 to 6%, according to Scott. A perimeter single track progressive trail. Good opportunity for a pump track, cyclocross course, and skills area. Great spectator opportunities. Opportunities for great rock work. Platforms or start hills would start the drop lines for anywhere from beginner to expert jump lines with slopestyle features anywhere from natural jumps to wooden lip jumps, berms log rides, and wall rides. Threats–It would cost more than a bike park at Chapman Hill. Political opposition from people with homes in the Rivergate Center across the river from the park. This is a joke, right? “Enticed” by city officials? Which ones? SWOT? Fantastic jump line? SECOND ice rink? A professional park builder was enticed to a different location by people that probably can’t even ride a wheelie? Didn’t I read somewhere that work was to BEGIN on Chapman this year. Wasn’t the submission to the Bell Grant contest centered around that area? Wasn’t this all “approved” – now Durango is looking for a different location? Cundiff Park? Perhaps the most NON MOUNTAINOUS area in town, being developed for mountain bikes? Shirley, you can’t be serious. Face it. The City of Durango doesn’t want to join the 21st century. How long ago was that fundraiser held, that showed the movie and hinted at trails on Chapman? Durango, actions speak louder than words. In the last 5 years, Durango has found every excuse in the book to NOT assist in creating a freeride/dh solution for local riders. It doesn’t take this long to come with and create a solution. In the mean time, municipalities across the nation have recognized the needs and benefits, and worked to create such places for progressive riders. Durango is now back to trying to find a location? It’s okay though. The riders that know, know where to go for the goods. Looks like that’s the way it’s going to be for the foreseeable future. Durango can’t find a place for Freeriders, but freerides already have places. Ironic, how the local poach lines remain, and are maintained by local riders while the city and fs turn a blind eye to it. Hint no. 1: work to legalize the existing lines. They’re not going away, and Durango, you’re not working to close them – so why not work to make them legit? Apologies for the tirade, but this is truly ridiculous. I’m not really sure why the initial feasibility study got distracted over at Cundiff Park. I’m guessing that the style of bike park that Scott is conceptualizing for Cundiff would be analogous to some of the terrain found at Valmont Bike Park in Boulder. At Cundiff, it’s different terrain for different types of bikes, and I’m guessing it’s not too friendly for downhill rigs. It was my impression that the ball would have been rolling on the Chapman Hill Bike Park Project by last fall, but the gears of government roll slowly. As for my writing, it can always be better. My attribution in some of that wording could have been better. I added some context, attribution, quotes and specifics after reading your comment, but will continue to add information.